In an interview with People Magazine on Tuesday, Levi Johnston admitted: "I publicly said things about the Palins that were not completely true." On Wednesday, the CBS Early Show failed to make any mention of the admission, despite having provided a media platform for Johnston last year by conducting exclusive interviews with him. On the April 8, 2009 broadcast, co-host Maggie Rodriguez conducted her first interview with Johnston, and introduced the segment by proclaiming: "He [Johnston], along with his mother and sister, sat down with me last night for an interview to clear up the 'lies' they say the Palins have been telling about them." Rodriguez sympathized with the former boyfriend of Bristol Palin by wondering: "Did you get your heart broken?" During a September 3 segment on Johnston's latest attack against the Palins, Rodriguez declared: "And shocking allegations that could shatter former Alaska Governor Sarah Palin's conservative family image. If she chooses to believe what Levi Johnston is saying." Rodriguez's second interview with Johnston came weeks later on October 29: "He is back on the offensive in this he-said-she-said battle that began shortly after the presidential election....he says he's trying to show the world the real Levi." In reaction to that interview, Sarah Palin called out the network for promoting Johnston: "CBS should be ashamed for continually providing a forum to propagate lies." On the November 17 Early Show, Rodriguez touted an exclusive interview with Johnston on the CBS entertainment show, 'The Insider': "Levi Johnston says he is winning the war of words between Sarah Palin and him. We’ll hear from him." 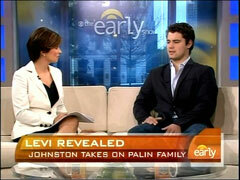 Later, correspondent for The Insider, Chris Jacobs, declared: "Sarah Palin lashing out at Levi and now Levi fires back." In the Tuesday interview with People, after Johnston confessed to making false statements about the Palins, he added: "I owe it to the Palins to publicly apologize." One wonders when CBS will offer a similar apology for so aggressively promoting Johnston, despite his lack of credibility. At the very least, the network should acknowledge the fact that he now recants past statements he made on their air.